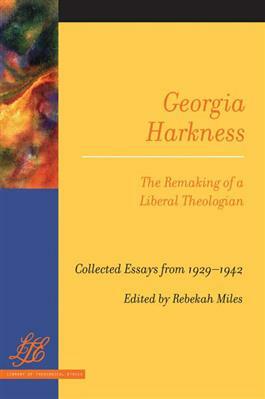 Georgia Harkness (1891-1974) was a Methodist theologian and the first American woman to teach theology at the seminary level. A leader in the ecumenical movement, Harkness strove to make theology accessible to the laity. This book is a compilation of writing from early in her career that appeared in publications such as The Christian Century, Religion in Life, and Christendom. Although her theology shifted somewhat during these years, Harkness held fast to her belief that liberal theology would remain "the basic American theology," a prediction that was out of step in the 1930s but is growing more credible today. The Library of Theological Ethics series focuses on what it means to think theologically and ethically. It presents a selection of important and otherwise unavailable texts in easily accessible form. Volumes in this series will enable sustained dialogue with predecessors through reflection on classic works in the field.